Haywood Cooper Sullivan was many things during his life: passing record holder at Dothan High School (Alabama), college All-SEC quarterback and baseball standout (Florida), bonus baby, American League catcher, manager, general manager, and major-league ballclub owner, and to top it off, a self-made millionaire. Sullivan was born in Donalsonville, Georgia on December 15, 1930, and raised in Dothan, in southeastern Alabama, where he played both football and baseball in high school and was considered a blue-chip quarterback. Upon leaving high school, Sullivan was heavily recruited to play football by both Auburn and Alabama, but chose Florida because he considered their offense to be more wide open and passing-oriented.1 Sullivan, who grew up in a working-class family, born to Ralph and Ruby (Lee) Sullivan, had many things to consider when making his decision on where to play. Ralph worked as a truck driver for Newton Grocery Company in 1939 and as a shipping clerk for Blumberg’s Department Store in 1951.2 Location of the school was a major factor as Sullivan’s family did not own a car. Sullivan had a former high school teammate, William A. “Bubba” McGowan, who was already attending Florida and was a holdover from the 1949 season. The McGowans traveled to Gainesville to see their son play on a regular basis and could give the Sullivans a ride. It may not have been the deciding factor but having a way for his family to see him play definitely weighed heavily in Haywood’s decision. McGowan often talked of Sullivan’s power arm and swears that he once saw him throw a baseball from one goal line to the other on a single bounce. McGowan also proclaimed that Sullivan had such a soft touch that his passes were easily catchable by his receivers. Sullivan’s “catchable ball” was one of the main reasons he was named All-SEC quarterback with some thinking he was good enough to have been All-American. Haywood was also a standout on the baseball field and was referred to as a man among boys. Buddy Martin, writing in The Boys from Old Florida: Inside Gator Nation stated in a later time, NFL scouts would have been throwing money at Sullivan - but pro football didn’t pay as much as baseball in those days. Sullivan received a great deal of attention from major-league scouts. In the end, the Boston Red Sox offered Sullivan a $75,000 bonus and Bob Woodruff, Florida’s football head coach sought the help of future baseball Hall of Famer Bill Terry for advice. Terry asked Sullivan, “Do you mean to tell me you get this money even if you don’t make it to the big leagues?” Sullivan said that he did and Terry replied, “Then boy, what are you waiting for?” Hardly the response Woodruff was expecting from the guy he brought in to keep his quarterback on the team. 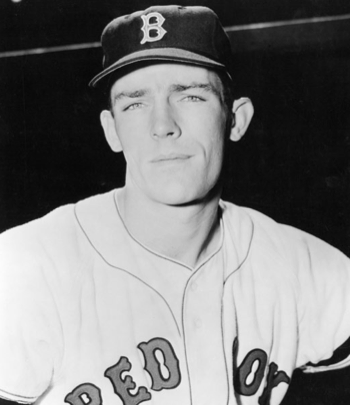 Sullivan signed with the Red Sox in June 1952, thus ending his football career. While in the service, Sullivan played quarterback for the Fort Jackson (South Carolina) football team5 and also played baseball. He missed two baseball seasons to military service, but returned in 1955 with the Double-A Louisville Colonels as one of baseball’s best catching prospects. In 128 games with Louisville, the 24-year-old Sullivan batted .258 while slugging .389 - numbers good enough for the American Association all-star team. Coming into the 1957 season, Sullivan was thought to have a shot to stick with Boston. His 6-feet-3, 220-pound frame and that he was a right-handed, long-ball hitter were said to be a perfect fit for Fenway Park.6 Boston brought in Sheriff Warren Robinson, manager of Boston’s Oklahoma City farm team, to tutor Haywood on the finer points of catching.7 He made the Opening Day roster, and played two early season games, finishing 0-for-1 as a hitter. When rosters had to be reduced on May 15, Sullivan was optioned to the Miami Marlins. In all, Boston had invested nearly $1 million on Sullivan and other “bonus baby” players in the early 1950s and none of them had become a star player. Some had been traded and some, like Haywood, were by 1959 facing what might be their last chance with the team.15 He’d always hit well in the minors, and it was said there was no player in Red Sox history who had more people rooting for him than Haywood Sullivan coming into the 1959 season. He arrived at spring training fully recovered thanks to a regimen of offseason swimming.16 Sullivan began the season as the Red Sox third string catcher, but rarely played–just four game and two hitless at-bats through June 12. He was then demoted to the Triple-A Minneapolis Millers. In 57 games with the Millers, Sullivan batted just .235 with eight doubles. Sullivan did help the Millers win their second consecutive American Association championship. With Sammy White holding out, Sullivan began the 1960 season sharing the catching with rookie Ed Sadowski. In April Sullivan was voted the Hardest Worker in Camp, Surprise of Training Season, Most Improved Player, and for the third consecutive season, the Most Likely to Improve by The Sporting News.17 After six years and 15 at-bats Sullivan recorded his first major league hit on April 19 off the Yankees’ Jim Coates. His first homer came on May 17 of Chicago’s Bob Shaw. Overall, he posted a .161 batting average in 52 games with three home runs and 10 RBIs in 124 at-bats, hardly what people expected out of a would-be hard-hitting receiver. In June, the Red Sox acquired catcher Russ Nixon from the Indians, who promptly took over as the starting catcher. In 1964 he skippered the Birmingham Barons of the Southern League. The next year, he was placed in Triple A, to manage the 1965 Vancouver Mounties. His season started off like his previous two until a rainy Saturday in May. He’d been out house-hunting in Vancouver, but found a message waiting for him when he returned to his hotel: call Kansas City. Forty-five minutes later, Sullivan was the Athletics’ new manager and en route to Kansas City. At age 34, Sullivan was the youngest manager in the major leagues at the time. Although Sullivan was young and inexperienced, the organization believed he demonstrated exceptional qualities of leadership and the ability to get the most out of his players, which they considered to be very important.20 The club began the season 5-21 for Mel McGaha, then Sullivan managed the A’s to a 54-82 record. General Manager Hank Peters was a big fan of Haywood and believed that Sullivan had done an outstanding job as manager. In March 1978, Jean Yawkey became a full general partner when she donated Fenway Park valued at $5.5 million, plus $1 million in cash to the Sullivan-LeRoux group bringing the total bid to $20.5 million. The suit filed by A-T-O was dismissed and the new Sullivan-LeRoux prospectus was mailed to the American League owners.32 The deal was approved in May of 1978 and the trio officially took over full control of the club. The 1978 season was the first for Sullivan as GM and it was a memorable one for fans of the Boston Red Sox. On July 8, Boston held a 10-game lead in the American League East Division but was overtaken by New York in mid-September. The Red Sox managed to tie the Yankees on the last day of the season thanks to an eight-game win streak and force a single-game playoff for the pennant, won by the Yankees. In 1979, the Boston Red Sox selected Marc Sullivan, Haywood’s son, with the 52nd pick in the draft. The Red Sox claimed they had Marc rated as the number two catcher in the draft. Haywood Sullivan stated numerous times that he “had nothing to do with the drafting, evaluating or selecting. That was done by Eddie Kasko. But I’ll be the one who gets knocked for it.”33 Marc Sullivan managed to reach the major leagues, playing parts of five seasons with the Red Sox, including three as the second-string catcher. He hit just .186 in 137 games, and he and his father were ridiculed as long as he remained in the organization. Haywood Sullivan remained the general manager with Boston until February of 1984. During his six seasons as GM, the Red Sox posted a 499-416 record, a .545 winning percentage. In 1977, Sullivan said, “I don't think you can trade a Fisk, a Jimmy Rice, a Fred Lynn, a Carl Yastrzemski, or a Rick Burleson. When you trade key men like that, you are just defeating your own purpose.”34 Before the 1981 season Sullivan, however, did just that, trading Rick Burleson, Butch Hobson, and Fred Lynn and most famously, letting Carlton Fisk become a free agent after he failed to offer Fisk player a contract before the deadline set forth by Major League Baseball. Other than Fisk, the players were traded because the team did not want to pay them according to the much higher salary levels that players were beginning to attain in this period. He and Buddy LeRoux became unpopular with Boston fans and with the team. Boston had lost three of their most popular players in one offseason and outside on Yawkey Way, vendors were selling bumper stickers that read HAYWOOD AND BUDDY ARE KILLING THE SOX. 1 Buddy Martin, The Boys from Old Florida: Inside Gator Nation (Champagne, IL: Sports Publishing, 2006), 32-33. 2 Thanks to Susan Veasey of the Houston Love Memorial Library for checking Dothan city directories. 3 The Sporting News, June 25, 1952, 33. 4 The Sporting News, April 1, 1953, 22. 5 The Sporting News, September 2, 1953, 38. 6 The Sporting News, February 27, 1957, 8. 7 The Sporting News, March 20, 1957, 5. 8 The Sporting News, May 29, 1957, 32. 9 The Sporting News, July 3, 1957, 38. 10 The Sporting News, November 6, 1957, 15. 11 The Sporting News, February 26, 1958, 19. 12 The Sporting News, April 9, 1958, 16. 13 The Sporting News, April 16, 1958, 8. 14 The Sporting News, October 22, 1958, 9. 15 The Sporting News, November 26, 1958, 30. 16 The Sporting News, March 4, 1959, 8. 17 The Sporting News, April 13, 1960, 14. 19 The Sporting News, July 27, 1963, 31. 20 The Sporting News, May 29, 1965, 15. 21 The Sporting News, August 14, 1965, 17. 22 The Sporting News, October 30, 1965, 31. 23 The Sporting News, December 11, 1965, 6. 24 The Sporting News, December 11, 1965, 15. 25 The Sporting News, December 11, 1965, 6. 26 The Sporting News, January 22, 1966, 13. 27 The Sporting News, October 15, 1977, 9. 29 The Sporting News, November 5, 1977, 20. 30 The Sporting News, November 19, 1977, 43. 31 The Sporting News, February 4, 1978, 45. 32 The Sporting News, March 18, 1978, 45. 33 The Sporting News, June 23, 1979, 6. 34 Sports Illustrated, May 11, 1981.